Native American pottery is not only rich in history and cultural traditions, but they also make stunning decoration pieces for homes with a rustic flair. 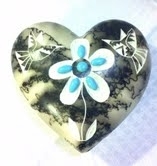 Completely hand-spun and hand-painted, these pieces can bring authenticity to your home design. 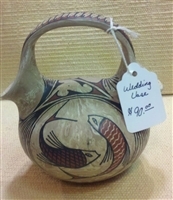 We carry very well-known types of Native American pottery, like Navajo Horse Hair Pottery and Mata Ortiz Pottery. 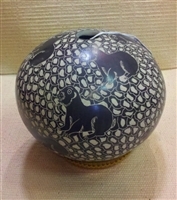 Horse hair pottery is known for its intricate designs using real horse hair, from the mane or tail, inside the work of art itself. While the end result is striking in its beauty, it also holds a strong spiritual value and connotation towards viewing animals and nature in high regard. 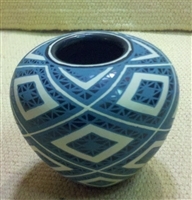 Mata Ortiz Pottery is also a high hit in home décor, even making appearances in art galleries and museums around the world. Each and every piece is made by hand with only natural elements straight from the environment of the Mata Ortiz village in Chihuahua, Mexico. 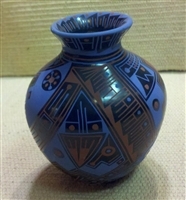 Held in such high, aesthetic esteem, we are proud to offer you our collection of Native American pottery. 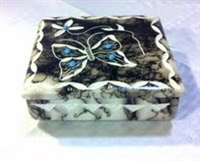 For questions about an individual item, feel free to contact us at sales@CountryArtsandJewelry. 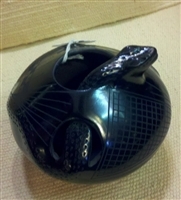 We ship the majority of our pottery seperate from other items. We will box smaller pieces together depending on how safely they'll travel packed together. Pieces that are 4x4x4 or smaller typically dont have a ship alone tag. Handmade by Mata Ortiz artist. Black etched design. 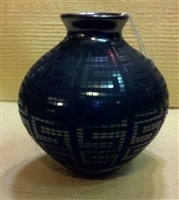 We ship the majority of our pottery seperate from other items. We will box smaller pieces together depending on how safely they'll travel packed together. Pieces that are 4x4x4 or smaller typically dont have a ship alone tag. Native American Made, Navajo Horse Hair Pottery, Etched Bear.